This Saral Ushtrasana (The Simple Camel Pose) pose focuses on the naval area, helps slim and tone the waist and neckline. At the same time, it helps strengthens the nerves and muscles of the arms and lower legs. As it focuses on the naval area which stimulates on the Manipura Chakra, it also helps tone up the abdominal viscera such as the liver, kidney, pancreas and bladder, as well as providing relief to stomach and intestinal problems. 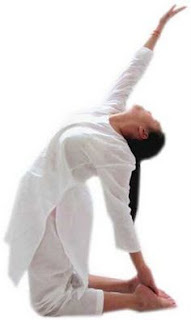 It also stretches the lumber and sacral regions, which is beneficial for those suffering from backaches. People suffering from knee injury should avoid attempting this Asana. Note: Please search for "Vajrasana" pose. 1) Assume Vajrasana (the diamond pose) and relax the whole body. 2) Place the left hand on the left heel. 4) Again, inhale slowly while raising the buttocks off the legs and push the hips, abdomen and chest forward, as far as possible. 5) Hold the breath and stay in the final position for few seconds. 6) Exhale slowly and return to Vajrasana. 7) Change hands. Perform 4 times each side alternatively. Slightly separating the knees, bending the ankles and raising the heels while keeping the feet vertically on the floor with the toes facing inwards will make the pose easier for you. I believe the practice of Yoga is stretching to your very best. In short, don't do it if it's not comfortable! This asana does not seem that painful to me. There are more asanas that require waaaay lots of stretching. A quick question. When we exchange hands, do we then put our right hand on the right heel? Yogini is correct when she said that a practitioner should not proceed practicing a pose if he or she is not comfortable with it. For this pose, the force is not entirely supported by the spine, but also the left hand as some force is placed on the left heel. Audrey, you are also correct. When you practice this pose with the other hand, place your right palm on the right heel.